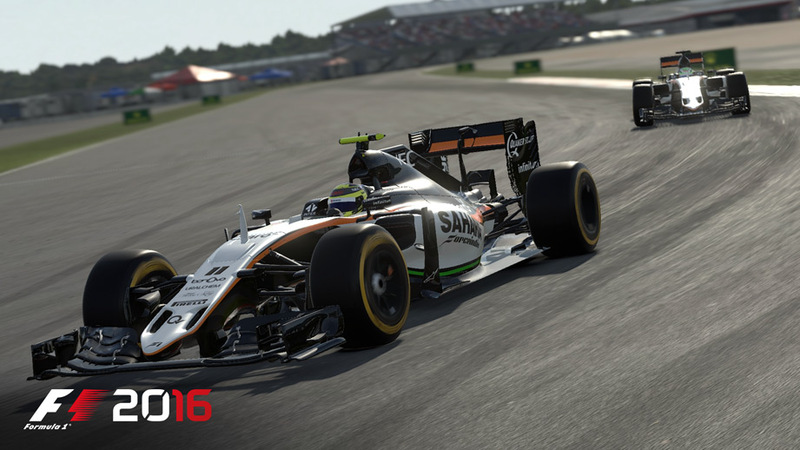 Codemasters' Formula One racing game returns this year with a reworked career mode. In most racing games, you start out driving a steady, sensible car. You slowly upgrade to faster autos, and are given plenty of time to adjust to their improved handling and speed. Not so F1 2016. In this game you're dropped in at the deep end, and instantly get to slip behind the wheel of some of the quickest racing vehicles on the planet. It takes some time to get used to the sheer speed of the game – and indeed the handling of F1 cars. Thanks to the enormous downforce they exert, corners can be taken at blistering velocities under full acceleration, and braking is fast and very aggressive. Their handling borders on the twitchy, and much of the time it feels like you're driving on a knife-edge, with little to no margin for error. It's simultaneously highly exciting and nerve-wracking. 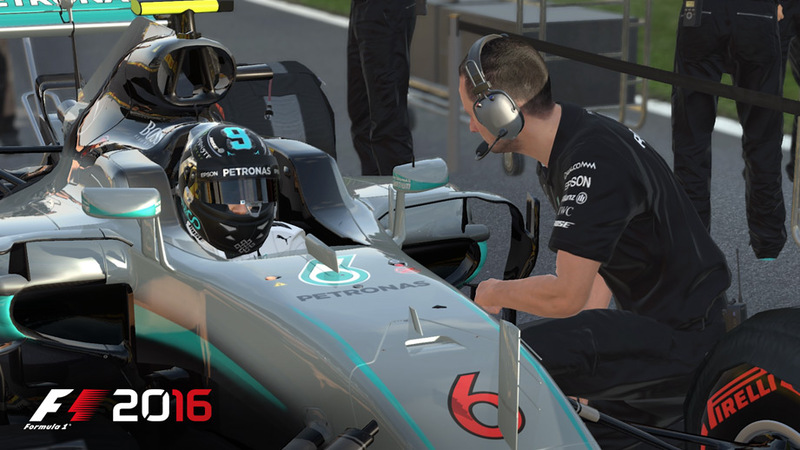 The centerpiece of F1 2016 is its comprehensive career mode. Once you've entered your name and nationality, chosen an avatar and race number, and designed your own helmet from a set of templates, you start your 10-season career by choosing a racing team. All eleven official Formula One teams and their drivers are represented, and there are essentially three tiers of manufacturers. The top teams have higher expectations from their designated drivers, and set you goals such as winning the Championship within the first two seasons, while the lower-tier teams give you a longer period of grace before expecting a season full of podium finishes. Lower-level teams also give you a boost to your career score, making the choice of an underdog an interesting and potentially more rewarding one. I chose to join the mid-tier McLaren Honda team, and after some introductory preamble started my first racing season in Melbourne, Australia. After spending a little bit of time tweaking the myriad of assists and settings – there's the usual array of options such as variable traction control, braking assists, dynamic racing line, auto or manual gears, and so on – I was ready to drive onto the track and start practicing. Like a real F1 weekend, there are three practice sessions, and also a fourth one-shot qualifying option where you race a flying lap to set the fastest possible time for a grid position. The practice sessions are useful for setting up your car, choosing the right tires, and getting a feel for the track. Cars can be tweaked and fettled in a wide variety of ways, and if you're into tinkering with your vehicle, this part of the game is really quite deep. I chose not to mess with the general car settings, and simply selected the tires that were recommended to me. The team sets goals for qualifying and the main race itself, and you garner points if you hit them. You also gain bonus points for doing things like running clean laps, not using the "flashback" rewind option, and passing other cars, and these can be spent on researching and enhancing different aspects of your car, such as improving its weight or upgrading the engine. This helps make engaging in practice sessions a worthwhile investment of your time. After qualifying and placing sixth on the grid, I was ready to start my first race – and this turned out to be quite a challenge. Starting isn't just a case of pressing the throttle and waiting for the race to begin (at least, not with the option I chose). Instead, you have to keep your finger on the clutch and dial in the optimal revs to launch. The timing lights count down, and once they're all off, you can then dump the clutch and hopefully get off to a good start. It helps make the beginning of a race interesting and quite exciting. However, I initially found it very difficult making my way through the packed grid and around the first few corners without colliding with another car. Successful getaways off the grid are definitely one of the trickiest aspects of this game, and it took me a number of restarts to properly learn how to set off without damaging my vehicle or getting penalized for banging into a fellow racer. The key here is to drive commandingly, but conservatively – don't rush into the first corner at top speed, but instead find space within the pack and defend it. Critical modulation of the throttle and brakes are required here, and once you successfully navigate around the first few corners, cars begin to get a little more strung out, and you can start to plan your attack against the drivers who are in front of you in earnest. Racing in F1 2016 is intense, and even at the middling difficulty setting I chose, I found I was struggling to stay with the leaders. In a way, this helps to make the game feel very authentic – essentially putting you on a long-term track where you slowly improve over time. It also serves to make your career feel more rewarding this way, as incremental improvements in finishing positions feel like actual achievements. If the racing is too difficult (or too easy), you can always adjust the difficulty at any time between races. I tried out the lower difficulty settings for a couple of races and found them a little too easy: I was able to take pole position without any problems, and finished ahead of the field by a few seconds. I also checked out a harder difficulty setting and got seriously left behind by the pack. 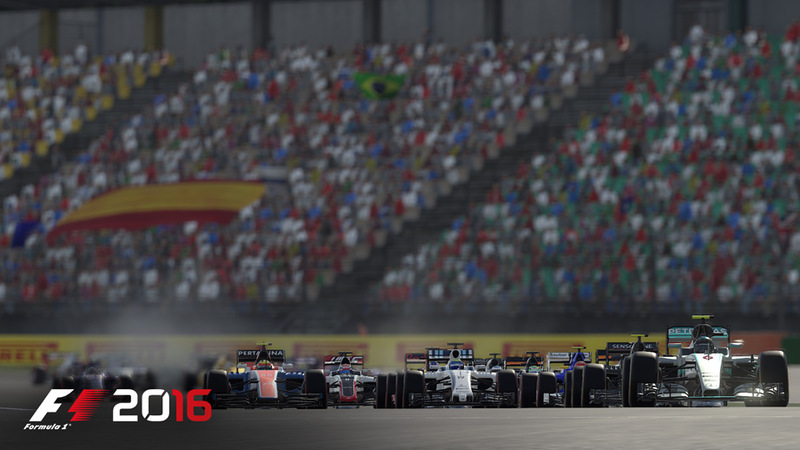 What's clear is that F1 2016 is designed with a broad set of players in mind, and whether you're an expert or a rookie, you should be able to find a level of challenge in the game that suits you. After my first race, I was told that I had a rival. This aspect of the game pits you directly against another driver, and your performances are compared after each race and qualifying session on a variety of criteria. Points are scored for each aspect in which you beat the other driver (and vice-versa) and the objective is to be the first to score 20 points to "win" the rivalry. It's a nice idea, and one that helps add a little extra dimension to the competition. 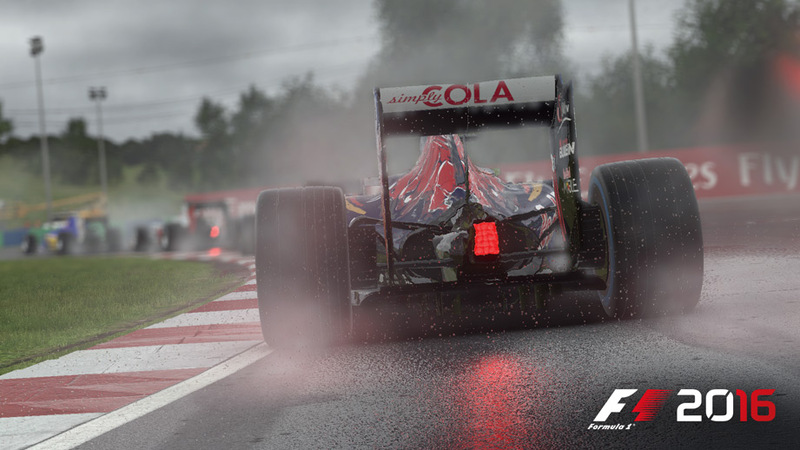 F1 2016 also includes wet weather racing, which I found really entertaining. Here, it's all about staying on the racing line – which is generally drier than the rest of the track. The moment you drift off the line onto the wet part of the track, the car loses a tremendous amount of grip, and you have to be very careful about how you use the throttle – otherwise you'll find yourself slipping and sliding all over the road. Braking distances are also significantly increased, meaning you really have to concentrate hard to drive successfully. Indeed, even in the dry, concentration is crucial to playing F1 2016 well. It's such a fast racing game, and there's such little margin for error that you have to stay very focused to cross the finishing line unscathed. Because of this, I found it a real white-knuckle racer – my joypad was creaking and groaning because I was gripping it so hard most of the time. That to me is a testament to how exciting and engrossing the action is. In terms of its graphics, F1 2016 looks great, but isn't quite in the same league as racers like Project CARS and Forza 6. Cars and tracks are nicely rendered and detailed, but the lighting and some of the career mode intermission and celebratory screens feel a little flat. Still, that said, F1 2016 runs fast and smooth, and overall it articulates F1 racing very well. Sound is similarly consistent: From the scream of the engines to the decent voice acting and commentary, the game captures the essence of F1 racing nicely. To be honest, I'm not much of a fan of F1 racing these days, and haven't followed it for a number of years – but I really enjoyed playing the game. Thanks to its exceptionally comprehensive options, you're able to set the game up to offer a level of challenge that's perfectly tailored to your skills, and that makes the racing tight and genuinely thrilling. Combine that with the incredible pace of the action, excellent AI, multiplayer racing for up to 22 players, and details such as real F1 rules and regulations, and you have a thoroughly entertaining racer that should definitely keep F1 fans happy – but also appeal to racing enthusiasts in general. An in-game laptop is used to navigate through the game's myriad of menus, and it works very well. 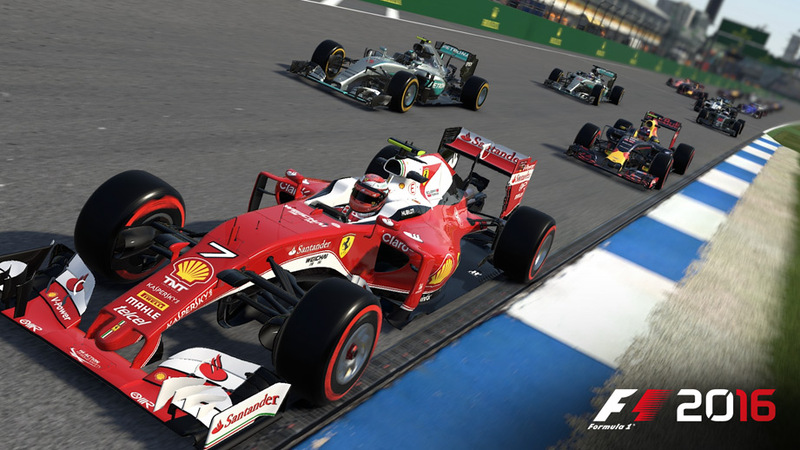 With a career mode spanning 10 seasons, plus a multiplayer mode for up to 22 participants, there's plenty to keep F1 fans invested in the game. From the scream of the engines to the decent voice acting and commentary, the game captures the sounds of F1 racing nicely. Very good. F1 2016's visuals are fast and smooth, and cars and tracks are nicely rendered and detailed.